RONO HILLS, Feb 12: Rajiv Gandhi University Vice Chancellor Prof Saket Kushwaha announced that the university will offer free courses under its Institute of Distance Education (IDE) to the students passing out from Itanagar-based Donyi Polo Mission School for the Hearing and Visually Impaired. This decision was taken during and interactive session titled ‘Art for integration’ – an exchange programme for students of the Donyi Polo Mission (DPM). The event was organized by the IDE in collaboration with Bhopal (MP)-based Indira Gandhi Rashtriya Manav Sangrahlaya and RGU’s Arunachal Institute of Tribal Studies (AITS). The students had come for a field trip to RGU to celebrate the valedictory session of the national seminar on ‘Cultural heritage of Arunachal Pradesh’ which was held here from 11 to 12 February. The university has also decided to initiate higher secondary education through the National Open School for the students passing out from the DPM. The children of the school visited the AITS museum, accompanied by the museum’s director Dr Simon John and Dr Tarun Mene, and followed it up with a visit to the university’s smart library, where librarian M Maltesh and deputy librarian DK Pandey gifted the children Braille books. 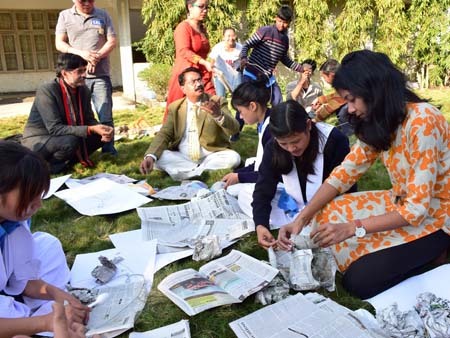 Later, guest faculty from RGU’s fine arts & music department, Manju Rajak, along with the VC held a workshop on sculpture-making and interacted with the students. As part of the valedictory session of the national seminar, the students performed songs, a folk dance and a skit on national integration at the AITS. The programme was coordinated by RGU Assistant Professor Moyir Riba.